A chance for current members to come in an work on test requirements and practice outside of normal class. Current members only – not a day to come observe or try out. 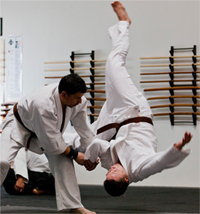 Plano Aikido Center is a nonprofit organization. Dues are collected by members and are used for the good of all members to pay for the practice location, insurance, and organization taxes and status. Regular instructors (non-seminar instructors) are unpaid and donate their time to the center. Student membership $40 for 3 days per week. $35 per child, for Saturday morning children’s class. A parent may practice with the child for an extra $10 ($45 total) — Required for any child under 7. The “family discount” above doesn’t apply to Kids Class, except for the Total Family membership cap. (each child costs $35 per month). * Direct Draft Checking (preferred): supply a voided check and monthly fees with be automatically drafted. This can be canceled at any time.